The BBC is expected to ask the government for money to fund the world services - which it will match with funds raised by commercial enterprises such as BBC World News. Licence fee income will not be used. 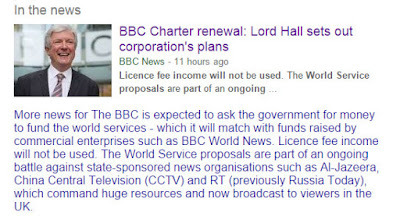 The World Service proposals are part of an ongoing battle against state-sponsored news organisations such as Al-Jazeera, China Central Television (CCTV) and RT (previously Russia Today), which command huge resources and now broadcast to viewers in the UK. Al-Jazeera is controversially funded by the Qatari government, but, despite this, has won a slew of awards. The network does not publish budget figures; but informed estimates of the "huge resources" it commands place its annual budget at around £66 million ($100 m). By comparison the BBC World Service annual budget is £245 million ($373m). Of course we need a strong and independent BBC. That is why its present bloated and self-serving structure must be changed. * Two hours after I uploaded this post the story on the BBC News website has been modified and the passage I quoted deleted. Confirmation that the passage originally appeared is given by the screengrab below taken at 12.00 BST today and this coverage. We certainly do need an independent BBC. Also on Facebook and Twitter. Any copyrighted material on these pages is included as "fair use" critical analysis only and will be removed at the request of copyright owner(s).